Those pics also bring to mind the juxtaposition of Palin in her skirt leaning against a motorcycle and the Messiah riding a bicycle in an urban setting (bike helmet and all). Wish I could remember who put those 2 photos up. I have to say, I can't trust a poodle man. Eee-gads! The 2 Americas in a nutshell. I don't have anything against poodles as such. My mom bred and groomed toy poodles to raise extra cash when I was a kid. My own preference now runs to big dogs, but I'm willing to give a break to a poodle man, just like I'm willing to give a break to a Harvard man — depending on all the other circumstances. 1) I believe you mean Kiefer Sutherland. 2) Poodles are fairly large dogs; they were bred for hunting. Obama appears to be holding a miniature poodle, which has been shorthand for "out-of-touch elitist" or "woman with too much time on her hands" for as long as I can remember. If you think that the majority of Americans would prefer the hunter to the dog lover, than you are very, very out of touch with mainstream America. Hunting is the hobby of a minority of people, and those who don't hunt often have a lot of disdain for those who do. I've only been hunting a couple of times, and it's not my thing. If it's your thing, then whatever, but for me, it's boring as hell, for one. For two, using a gun just seems unsporting. If I had the time, I might bone up on my archery skills and go hunting that way--probably be more fun. But back to the point: anybody who chooses a president based on their hobbies is an idiot. Alex, thanks, as always, for the comment. But isn't "choosing a president based on" their feelings about/dealings with animals what the HSLF just did? If so, we agree: They're idiots. You're entitled, of course, to your views about hunting. I hunted as a boy; I don't now, and haven't had good opportunities to expose my own kids to it, which I do regret. If either you or I lived in Alaska -- if either of us were one of the thousands of Alaskans who still rely on hunting to put food on their table, and go hungry when they can't -- we might both feel differently. Hunting can be fun, but it's not just for fun. Finally, and most importantly (see my final comment in the post re cognitive dissonance), being a hunter and a dog-lover is not a mutually exclusive proposition. I'd guess that some ginormous percentage of hunters, in fact, are also dog-lovers and/or -owners. Sarah Palin can field-dress a moose or haul in a net full of salmon, but then she cleans up pretty well in time to out-maneuver international energy companies or political opponents too. Some of us think those activities aren't inconsistent, but that it's pretty cool for someone who actually does them all to have a chance to ascend to the pinacle of our national government. Leif: You're right, both about Kiefer (correcting his name now) and the poodle sizes. As long as Obama doesn't wear a metrosexual fanny pack with a little yappy dog in it, however (not that there's anything wrong with that, as they said on Seinfeld), I won't fault him for preferring small dogs. As I understand it, the HSLF endorsement was due to Palin's opposition to having polar bears on the Endangered Species list and her support (against the results two Alaskan referenda, as I recall) for laws allowing the aerial hunting of wolves and a bounty thereto. Not her personal hunting. If I'm mistaken on this, feel free to correct. And when I talk about dog-lovers vs. hunters, I don't of course mean to imply that hunters aren't dog lovers--I know way too many hunters to believe that. I'm merely saying that if you juxtapose these two pictures, I'm pretty sure you're going to get a more pro-Obama sentiment. Hunting just isn't all that popular outside of certain regions. Even in those regions, there's a pretty big hunter/non-hunter divide. Living in suburban Kansas, I can tell you that's true. What I'm primarily objecting to is the idea that some "hobbies" are more "American" or "in touch" than others. People have different hobbies and interests. I never understood why the Kerry windsurfing pictures were so widely mocked. What's wrong with windsurfing? I don't understand why the Obama with a bike helmet picture is mocked. What kid of idiot rides a bike in an urban area without a helmet? What's WRONG with riding a bike? This is the same country that practically worships Lance Armstrong, isn't it? By contrast, why should it matter that Palin likes to hunt? Why should it matter that she's on a motorcycle? I know plenty of Democrats who ride motorcycles and hunt. I know Democrats who live and work on ranches, like George Bush. I don't care much for my fellow Obama supporters who deride Palin for her moose hunting. I like moose. It's delicious. And that she hunts doesn't really affect my opinion of her politics one way or another. 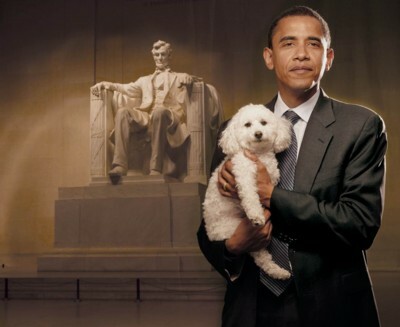 Similarly, I don't get the mockery over Obama holding a poodle? So what? Big freaking deal. What does it have to do with politics except for the absurd desire in America to worship shared habits and customs over logic and reason. The problem with both the Obama-as-animal-lover appeal and the bicycle riding is that they're phony. Obama is hardly a cyclist; most likely the photo was staged to make Obama seem hip, urban, green etc. I suspect that he doesn't often ride to the Hyde Park Co-op to go shopping. The dog/caribou photo sequence is phony in a different way. It draws a false parallel between Obama with the cute dog and Palin with the bloody caribou, in an attempt to insinuate that Obama likes animals while Palin is some kind of bloodthirsty pervert. A clear-thinking person sees the logical disconnect instantly, but it's obvious that the Humane Society is either not run by clear-thinking people or gets its funding mainly from sentimental ninnies who want to feel good about puppies and baby seals but aren't interested in knowing too much about where their meat comes from. An accurate comparison would be between Obama and Palin with both holding cute dogs (is there any evidence that Obama has a dog or that Palin doesn't like dogs? ), or between Palin hunting and Obama eating a steak or wearing leather shoes -- IOW, Palin catches her own food and Obama is just another posturing hack. IOW, Palin catches her own food and Obama is just another posturing hack. Are you implying that people should only eat what food they kill? I think the poultry, pork and cattle industries would disagree with you. "Note how this photo demonstrates Obama's easy grace in dealing with the French." The best one sentence description of why reading your ideas and notions is so much fun. Either the photographer is not an Obama fan or was too blinded in their adoration to notice the look on Obama's face is rather smug to say the least. 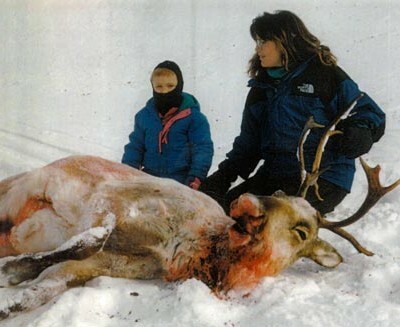 If the photograph of Ms. Palin had shown the caribou live and the child as the leftovers of a partial-birth abortion, she would be the heroine of the leftwingers instead of their pet hate. Regarding that picture of Obama on the bicycle: wasn't the back tire flat?